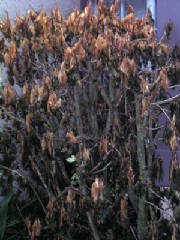 I am continuing to get questions about the freeze damage to landscape plants. All hope is not lost. Most of t he plants, especially the woody shrubs will recover, but it may take a while for them to return to their former size. I cannot stress enough how important it is to be patient. Even I am so tempted to prune the sad looking plants in my landscape. It is possible that we can still have another frost or freeze event before spring comes. The brown leaves on plants such as plumbago, croton, hibiscus, gold mound Duranta, Ixora, and firebush will help protect the plant in another cold snap. If some sprouts appear during warmer weather, the dead leaves can offer some protection. Almost all of these plants will sprout new growth in the spring. Even if a plant is dead to the ground, it might sprout from the roots. We did not have weather cold enough to freeze the ground in most of Florida. If you have palms that look like some of these pictures, it is very important that you spray the bud with Copper fungicide. This will kill any fungus that starts to grow on dying tissue. This fungus might kill the bud. Palms only have one growing point, or bud, and when it is dead, the palm is dead. Please reference the UF/IFAS Extension publication Treating Cold Damaged Palms at: http://edis.ifas.ufl.edu/MG318 for complete directions. I have added some pictures of plants in my immediate area. There is a lot of damage even down into Largo and St. Petersburg. I received a question from a subscriber who asks: How do I tell if I have pruned my banana plants correctly? I indicated in my previous post that banana plants were one of the plants that can be pruned back immediately after freeze damage occurs. They are herbaceous (do not have real bark) and will sprout directly from the middle of the stalk, if it is still living. Many times you will see this sprouting in a day or two after pruning. Use a pruning saw to cut the stalk about 1/3 of the way down from the top - this will usually remove all of the dead leaves. If you see a dark area in the center of the stalk, you have not removed all of the area effected by the freeze and you will need to remove more of the stalk. Move down about 10 - 12 inches and cut the stalk again. If you still see the dark center, you will need to continue taking off a bit at a time until you see a light cream to green center. Once you get to this point on the stalk you have reached the area where new leaves are still living. In a few days you should see a new leaf emerging from the center of the pruned stalk that will continue to grow and unfurl. If you find that you must cut your bananas all the way back to the soil line, they will most likely sprout new plants from the existing roots. Hopefully we will not experience more freezing weather this winter, but there are no guarantees. The Arctic blast that brought record breaking freezing or near freezing temperatures to our area for a number of nights in a row is finally behind us. Many of the plants that we have in our landscapes here in north Pinellas County were vulnerable to these temperatures. Once the temperature fell below 30 degrees for several hours, even covering plants did not completely protect them. Plants that have been damaged by the cold will look wilted, the leaves might turn brown and die, and some plants can look melted. Resist the temptation to start pruning these plants back. The damaged leaves help to insulate damaged plants from frost and further injury. Wait to prune cold-damaged oleanders and other tropical shrubs such as hibiscus and crotons until after they begin to sprout new growth with the onset of warm weather, maybe by late February. Once plants begin to sprout, be sure to prune below the new sprouts so that you cut into green healthy wood. Fertilize only after you see healthy new growth on these plants. It is often difficult to determine how far freeze damage extends. If you are worried that the plant is dead, gently scrape the bark near the base of a stem, if the cambium layer just under the bark is still green then the plant is alive. Some herbaceous plants, such as bananas, coleus, impatiens, gingers and begonias, have collapsed and need to just be cut down and removed. This will reduce fungal or bacterial problems as these dead plants decay. 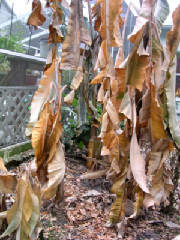 Banana plants will usually send up new pups from the root system in the spring. 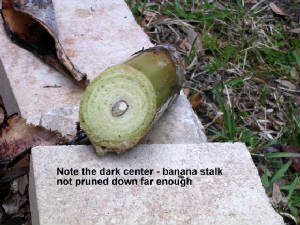 Large banana stalks can be cut about midway down to the roots. If you see healthy light green tissue in the middle of the stem, it might sprout from this point. If the interior of the stalk is brown, cut back further down the stalk until you find healthy tissue. We are experiencing a string of cold nights that may turn out to be quite damaging for our landscapes. We have had some frost and below freezing temperatures in our immediate area of north Pinellas County. We will get a bit of a reprieve Thursday and Thursday night. Friday night brings in more lower temperatures - 32 degrees, then Saturday and Sunday nights predicted to be around 29 degrees. There is a 30% chance of rain on Friday, so any covers you have on your plants should be removed so they don't become soaked. It is best to also turn off your automatic irrigation system when plants are covered or freezing temperatures are expected. Water potted plants well before covering them (moist soil retains more heat and well hydrated plants can suffer less damage). This also applies to sensitive plants that are in the ground. Water them well and then cover them before dark. If temperatures fall below freezing for 3 hours or more, covering may not help. Many of our woody plants might loose all of their leaves from freeing temperatures, but they should leaf out in the spring with some die back. I have already seen some frost damage on plants that I did not get covered last night. I just can't cover them all.